Oh man, I have lot to say about Mechwarrior Online. You know I love me some mech games! It’s definitely a ton of fun, and a very unique experience. It’s very tactical but still fast paced, most of the time. You have to take your time and plan your actions. You can’t just charge in, guns blazing. All that does is signal the other team too rain missiles down on your head. It is still in beta though, so it’s hard to criticize it. However, there are a lot of things I’d like to see improved. First of all, it takes FOREVER to save up enough money to buy a new mech, especially a heavier one. Literally hours upon hours. Smaller, scout class mechs are cheaper, true, but those don’t quite suit my playstyle. When you finally do graduate from using the trial mechs and get your own, the game finally starts. You gain experience both for your character and your chosen mech. Repair and ammo costs also become factor, which I like because it adds more danger to each battle and makes the game have a more persistant feeling. Choosing a mech to buy, though, and how to go about outfitting it, is impossible. The game gives you next to no imformation. I know it’s still in beta, but I had to pull up multiple wikis just to see what a weapon does and if I can equip it or not. It’d also be nice if player names in the in-game chat were color coded. When “this person killed this person” appears, I never know whether to cheer or not until I look at the score, which counts each team’s kills. Actually, all of the game’s social functions are incredibly clunky. If there’s a team chat, you know, before you get into a game, I haven’t found it. Creating groups and inviting friends isn’t as easy to do as it should be. I don’t know, the whole interface just isn’t as intuitive as I think it could be. But yeah, beta. I’m super excited to see what changes are made once the game goes live. I’m definitely going to keep playing it. This entry was posted on Friday, November 2nd, 2012 at 12:00 am and is filed under Comics. You can follow any responses to this entry through the RSS 2.0 feed. Both comments and pings are currently closed. I’d like to chime in and say Mechwarrior, despite the learning curve, is immense amounts of fun. Ence spent a lot of time carrying me last night, and even though I was failing horribly there still were some great moments. Ence got the pleasure of watching me die under a torrent of missiles when I walked into an obvious killzone. Even if the missiles hadn’t exploded, I’m sure I still would have been crushed by their sheer number. 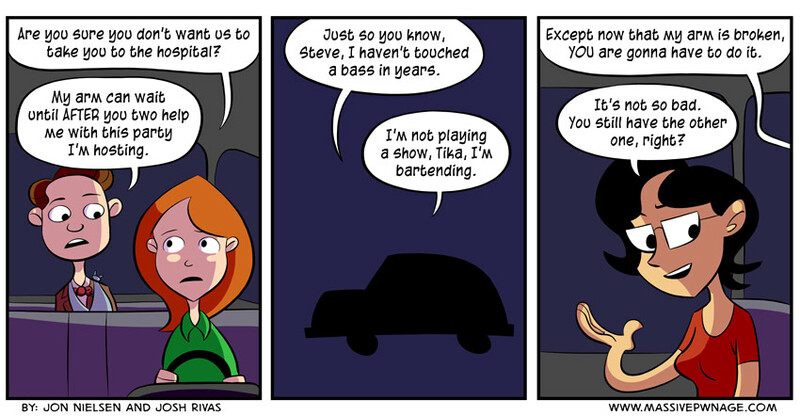 In b4 bartending becomes Tika’s new job that she tripped over right out of the… er… ran over. Thank you for mentioning MechWarrior Online. The last MW game I played was MW4: Vengeance, and it is by far my favorite. But once MWO goes live, I’ll give it a shot. I’ve avoided the beta, as to not tarnish my hopes for the game. And my hopes for MW5. This is not going to end well for Steve. hmm….. only thing thats missing now is zombies, then ya got a game that is similar to one i read in a book.